Invention by Professor Horst Schmidt-Böcking (Goethe University Frankfurt) and his colleague Dr. Gerhard Luther (Saarland University) is the basis for a novel marine pumped storage system developed by the Fraunhofer Institute for Wind Energy and Energy System Technology (IWES). How can the enormous amounts of electricity generated through offshore wind power be temporarily stored on site? Until now there was no answer to this question. After several years’ research work, the StEnSea project (Stored Energy in the Sea) funded by the Federal Ministry for Economic Affairs and Energy is now entering the test phase. In the framework of this project, IWES, the Fraunhofer institute in Kassel specialized in energy system technology, is now developing to application level the “marine egg” invented by two physics professors at Goethe University Frankfurt and Saarland University in Saarbrücken. 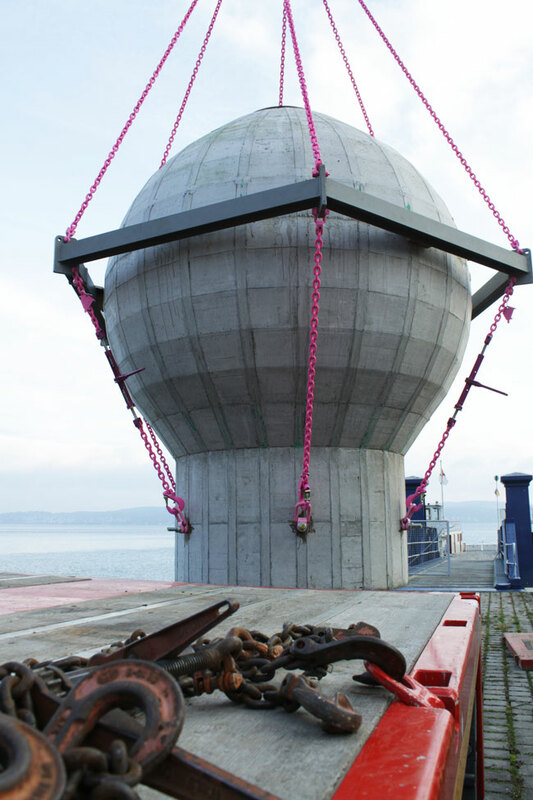 A model on the scale of 1:10 with a diameter of about three meters was brought to the ferry terminal in Constance on 8.11.2016 and lowered on 9.11.2016 to a depth of 100 meters about 200 meters from the shore in Überlingen. 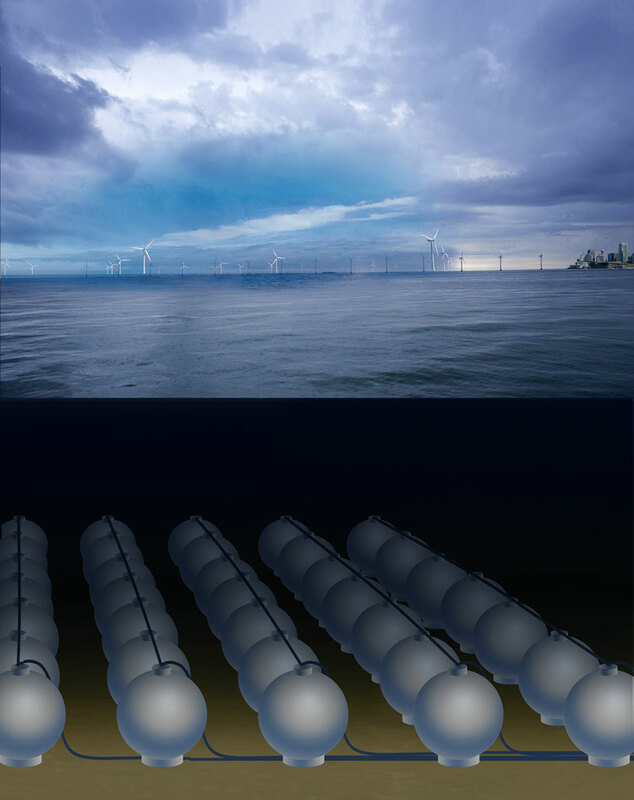 It will now be tested for four weeks: “Pumped storage power plants installed on the seabed can use the high water pressure in very deep water to store electrical energy with the aid of hollow spheres”, explains Horst Schmidt-Böcking, emeritus professor at Goethe University Frankfurt. To store energy water is pumped out of the sphere using an electric pump and to generate power water flows through a turbine into the empty sphere and produces electrical energy via a generator. Together with his colleague Dr. Gerhard Luther from Saarland University, Professor Schmidt-Böcking filed a patent for their principle for offshore energy storage in 2011, just a few days before the Fukushima disaster. The two inventors remember: “The rapid practical realization of our idea is actually thanks to a newspaper article in the FAZ. Georg Küffner, the technology editor, presented our idea for energy storage to the general public – as chance would have it on the 1st of April 2011. Lots of readers doubtlessly thought at first that it was an April Fool hoax, but experts at Hochtief Solutions AG in Frankfurt immediately recognized the idea’s hidden possibilities. Within a couple of weeks we were able to set up a consortium for an initial feasibility study with Hochtief’s specialists for concrete structures and the experts in marine power and energy storage at IWES in Kassel, the Fraunhofer Institute for Wind Energy and Energy System Technology”, recall Schmidt-Böcking and Luther.